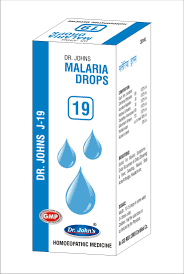 Information about Dr. Johns J-19 Malaria Drop Indications: Useful for the malaria symptoms cyclic occurrence of chills (shivering) & fever, sweating, nausea, body ache/arthralgia, headache etc. Composition: Each 1ml. Contains Cinchona Officinalis 10X 0.02% v/v, Aconitum Napellus 8X 0.02% v/v, Alstonia Scholaris 8X 0.02% v/v, Ceanothus Americanus 10X 0.02% v/v, Gelsemium Semper. 12X 0.02% v/v, Purified water q.s. to make 100% v/v, Alcohol content 30% v/v. Dosage Adults: 10-15 drops in some water 3-4 times a day. Children: Half the adult dose or as directed by the Physician. Use under medical supervision.